The ability to pay for buses, bikes, scooters, taxis and trains through a single app is on the way. But who should manage it? Photo by Sergio Ruiz. When you hop between bus, bike sharing, taxi and train, whose app are you going to use? Who is going to manage that experience? This month, Uber announced the addition of several new travel modes to its platform. This news caught the public transportation sector flat footed, and it raises questions for transit agencies and customers alike. Over the past few years, the idea of mobility-as-a-service (MaaS) – making lots of transportation choices available through a single platform and payment system – has started moving closer to a reality. The hope is that with ubiquitous access to MaaS, people can live easily without a car. Other parts of the world are farther along this path (Finland is seen as the leader). In the Bay Area, we are still taking the first baby steps to making MaaS happen. Individual transit agencies have developed their own payment apps, and FordGo Bike can be accessed using a Clipper card. These are important yet small endeavors, features rather than solutions. They are not going to achieve a meaningful scale of users, nor offer the range of mobility services that people want. A restricted mobility marketplace limits options. Just like how certain television shows are available on Hulu and certain shows on Netflix, and each requires its own subscription, the same could easily happen for MaaS, where some transportation services are only available in one MaaS app and others are in another app. This could undermine the extent to which MaaS supports seamless travel and offers an open and dynamic market, and it could further undermine public transit’s ability to function as a network. As of yet, there’s nothing precluding commercial MaaS operators from favoring their own solutions; public transportation could very well be sidelined in a commercial MaaS platform. Stories of the declining relevance of public transit belie the fact that there are 1.7 million public transit trips taken every day in the Bay Area. Public transportation is absolutely critical to the functioning of the Bay Area economy and its continued growth. MaaS should build on the public transit nucleus by offering those millions of regular riders additional services as extensions to how they currently use transit, meanwhile showing non-riders that public transportation can be a practical option. Private management reduces access and equity. Public transportation has a mandate to serve everyone, regardless of age, income, ability or access to digital tools. Commercial MaaS operators do not necessarily share that imperative and have tended to target specific demographics, typically the more affluent and digital savvy — the most profitable part of the market. The public sector has to shape MaaS in order to achieve goals of accessibility and equity. People have less incentive to make sustainable choices. A commercial MaaS platform does not necessarily incentivize users to make choices that support public sector goals, such as reducing pollution or reducing traffic. When the public sector shapes MaaS, we can use discounts and subsidies to incentivize more sustainable trips and offer rewards for walking, biking, scooting or taking transit. We can also use the platform to implement pricing, for example, letting someone “cash out” their parking space at work by trading it for transit tickets. Ultimately, the choices people make will depend on how the platform is designed and how services are priced and promoted. Restricted data limits our ability to manage transportation systems. As more trips are aggregated under a private sector platform, the public sector misses out on access to data that offers insights into travel patterns. These insights help the public sector understand how, when and where to deploy transit and help cities understand where to prioritize new investments. At least three transit agencies in the Bay Area already have their own mobility app and more are on the way. Without a coordinated approach to MaaS, operators will embrace technology separately, leading to greater inconsistency and fragmentation. We are at risk of repeating in the digital realm what Clipper solved for when it sewed our patchwork transit network together. The public sector needs to steward the mobility experience. There are many forms this could take. Government is not always the best technology developer or transportation operator, and for this reason doesn’t have to design the interface, develop the software, or operate every bus or bike. What government should be doing is setting a vision and a framework for MaaS that prioritizes choice and competition, meets public sector goals for access and sustainability, includes oversight, guarantees privacy and data security, and ensures that MaaS delivers benefits for all rather than just a few. Individual transit agencies will need to move away from standalone approaches to MaaS. Most importantly, we need to decide who is responsible for creating and implementing the region’s MaaS vision. In the Bay Area, the Clipper Executive Board is a key body that needs to embrace a forward-thinking MaaS vision with a larger, more prominent role for Clipper. Clipper can be more than a means to pay; it can shape and support mobility. This means embracing peer public transit operators as equal partners and being willing to engage and share a mobility platform with private transit operators. Public transportation operators should be less concerned with their services being cannibalized by private mobility services and more concerned with being ignored and left out of the future of mobility. We need to engage in conversation with private sector mobility operators, understand the motives and intentions of all involved, and find opportunities for collaboration. We also have to get our ducks in a row and make our region MaaS-ready. Today, not all of our transit operators are even on GTFS (the global specifications standard for transit data). In too many communities, it’s too difficult to purchase or add value to a Clipper card. Our fare policies are so complicated that you can’t find them on most transit apps. We don’t have multi-operator passes or passes that include transit-adjacent services like Ford GoBike. These are prerequisites for participating in a MaaS system where mobility options are offered as monthly subscriptions, yearly subscriptions or pay as you go. We haven’t thought through whether or not allowing commercial operators to sell transit tickets is a good thing or how to even approach the idea. Mobility plans offered by Whim, a Mobility as a Service platform in Finland operated by MaaS Global. In Finland, the government passed a law mandating that all mobility providers open their data and APIs to third parties. As a result, all transportation options available in Helsinki, from bus to bike to rental car to taxi, can be accessed and paid for using the Whim app. SPUR has advocated for great regional public transit maps and wayfinding, useful fare products, and a customer-focused design because people should have a great experience using public transportation. But what is called for now is far bigger. 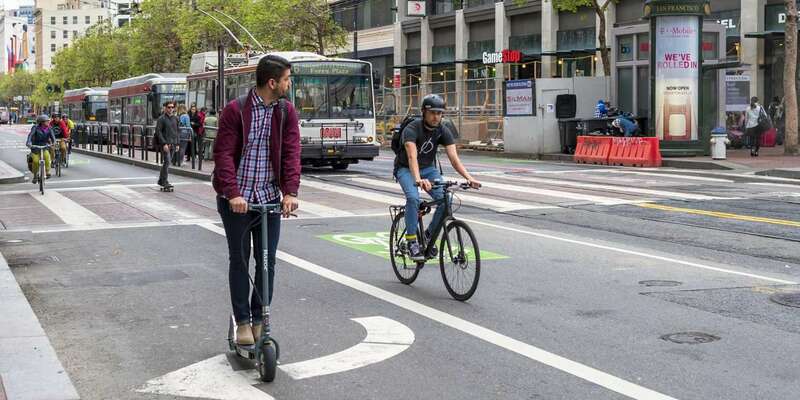 We ask the Bay Area’s transportation leaders to figure out how to shape a regional MaaS program, instead of standing by while the private sector steps in. As we saw earlier this month, our federal legislators apparently don’t know enough about Facebook to regulate it. But we are the Bay Area, and we can handle this: We invented online transit information with 511, Clipper is a small miracle (New York City still doesn’t have contactless payment cards), and we have the strongest regional transportation agency in the country (the Metropolitan Transportation Commission). We have a hyper-informed citizenry that wants to see technology deployed for public transportation good. It’s not too late to get the Bay Area’s MaaS on the right track.